A prominent collision repairer has blasted CCC for its refusal to join its competitors and include an option to refinish outer rooflines connected to quarter panels. When you refinish a damaged quarter panel, best practices require refinishing that outer roof area too unless the two are separated by an actual panel break. However, CCC doesn’t include that additional labor time when a user indicates they’re refinishing a quarter panel. It must be entered manually. If you’re smart, your shop is remembering to indicate that work and get paid for its time, Angelo’s Auto Body co-owner Nick Kostakis wrote in an email describing the issue. But since this panel configuration is extremely common, “It kind of begs for an automated solution,” Kostakis said in an interview. “We need a very efficient way to express that,” he said. 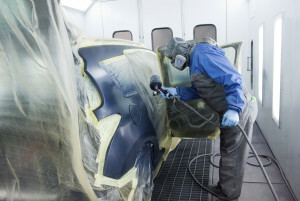 Those curious for more about paint shop profitability should check out “Paint Shop Performance” with John Fagan, PPG, at the SEMA Show as part of the Society of Collision Repair Specialists’ Repairer Driven Education series. Register here. By contrast, AudaExplore offers the option to blend into or fully refinish such a roofline, he wrote. Database Enhancement Gateway Administrator Art Harris said Mitchell also includes an automated way to indicate similar work. “Anyway, the absence of this feature (in CCC) causes ambiguity and friction between repairers and insurers, and lately, at least in my market, it is going one step further, with insurers stating that this outer roofline does not require ‘blending’ but instead, just clearcoat,” Kostakis wrote. It’s not that the insurers are necessarily refusing to pay repairers for work on the outer roofline, Kostakis said. It’s just a “hassle” to hash it out, he said, since any manual input values can be contested by either party as subjective. “It’s just one more place for us to argue where there’s no need to,” Kostakis said in an interview. “MOTOR cannot create a standalone refinish operation for a part that does not exist, unless it is (a) part of a parent assembly with an OEM part number, or (b) correlated with a sectioning operation of that parent assembly,” CCC wrote.